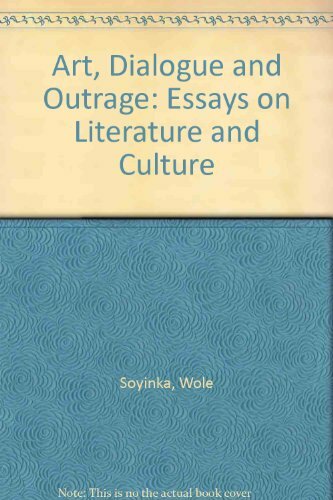 Art, Dialogue, and Outrage: Essays on Literature and Culture [Wole Soyinka] on Amazon.com. *FREE* shipping on qualifying offers. Nineteen essays discuss African, European, and American literature, culture, and politics. Never less than profound, Nobel Laureate Wole Soyinka's fierce and provocative contribution to the debate on multiculturalism brings together 19 iconoclastic essays on African, European, and American literature, culture, and politics. "Unquestionably Africa's most versatile writer".--New York Times. Art, dialogue & outrage : essays on literature and culture. Responsibility: Wole Soyinka. Imprint: Ibadan : New Horn Press ; Oxford, England : Distributed by H. Zell Associates, 1988. Physical description: xxxii, 344 p. ; 24 cm.